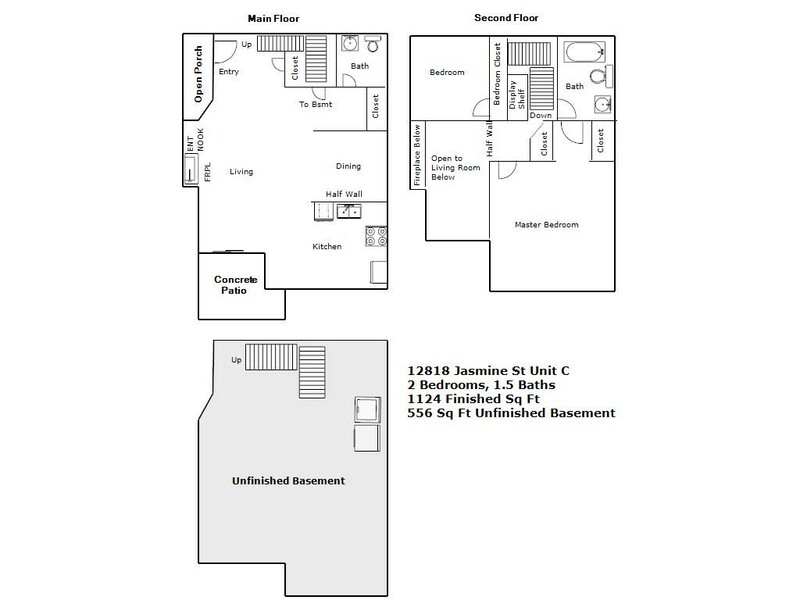 12818 Jasmine #C - RENTED | Robinson Investment Company, Inc.
Beautiful and immaculate 2 bedroom 1.5 bath townhome in Riverdale Park, a booming area of Thornton. This 1792 square foot townhome is like new and rents for $1750 per month with an $1750 deposit. Utilities are not included. I’m sorry, no pets. This spacious 2 story bright and airy townhome offers an inviting floorplan, vaulted ceilings and lots of windows streaming in tons of natural light. Tile floor at the entry with carpet in the large beautiful living room with gas fireplace and built in entertainment nook. The kitchen has newer appliances including a refrigerator with ice maker, dishwasher and space saver microwave. The kitchen is open to the dining room via a half wall providing convenience when eating and entertaining. An outdoor cement patio is located off the living room, accessed by a sliding glass door. There are two closets located on the main level, along with a half bath powder room with pedestal sink. Head upstairs to find the 2 bedrooms and full bath. The master bedroom is especially large and has 2 closets. The bright bathroom includes a deep oval tub. The 626 square foot unfinished basement offers tons of storage space and it is also where you’ll find the washer dryer. This unit also includes a one car garage with electric opener. In the summer, turn on the air conditioning to beat the heat or take a short walk to the community pool. This townhome is located just 3.5 miles east of I-25.